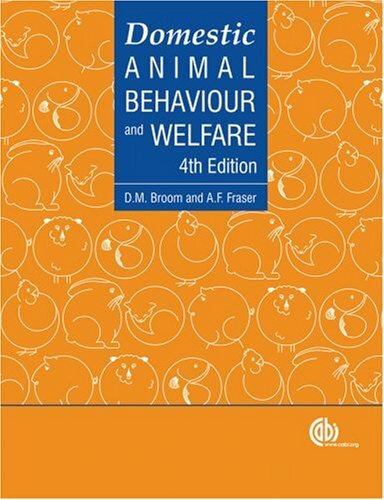 Domestic animal behaviour and welfare 4th Edition – Broom, Donald M.; Fraser, Andrew Ferguso Year 2007. Behavior is a significant indicator of health in animals and understanding behavior is the key to good management. Animal behavior and animal welfare science are fast becoming core topics in the curricula of agriculture and veterinary students. The eagerly awaited fourth edition of Farm Animal Behaviour and Welfare builds on the coverage of the previous edition, fully updating it to take into account developments over the last 10 years. This new edition covers companion animals, as well as farm animal species including farmed fish. It is an indispensible textbook covering the major and growing areas in agricultural and veterinary science and practice. Farm animals are very good subjects for behaviour studies, so many important advances in our understanding of fundamental aspects of animal behaviour have come from farm animal behaviour studies. Concepts concerning social structure, behaviour development, learning, cognition, parent–offspring relationships, sexual behaviour and the role of behaviour in coping with adversity have depended greatly on evidence obtained from farm animal studies. Studies of companion animals have also been important in these areas and the rapidly developing ﬁeld of anthrozoology, which includes interactions between humans and other species, has depended greatly on studies involving pets. If evolutionary questions are being asked, the changes in the species during domestication must be taken into account, but domestic animals have the same range of behaviour as wild animals. It is easy to obtain data about behaviour from farm animals: they are available in large numbers and are often genetically very similar to one another. Companion animals are especially suitable subjects for work on learning, behaviour development and social interactions with conspeciﬁcs and humans. Our understanding of domestic animal behaviour and welfare, however, is much enhanced by ideas based on studies of the behaviour of wild animals, laboratory animals and man. The results of work on a variety of species helps us to have an adequate appreciation of the mechanisms underlying domestic animal behaviour.